So as another meeting slowly (very slowly) winds to a close here in Geneva, it’s time to look at what happened over the course of the week-and-a-bit we’ve been here. At the Montreal Protocol’s 25th anniversary celebration last Sunday, my colleague Clare Perry gave a great speech on behalf of the NGOs involved in the ozone negotiations. The speech outlined why the (admittedly remarkable) achievements of the past quarter-century run the risk of being eclipsed by all the issues that the Protocol is currently failing to address. Among the issues the Montreal Protocol is struggling with are the immense banks of ozone-depleting substances, which currently exist in a regulatory void. When they were first assessed in 2002 they were estimated to be the equivalent of a staggering 21 gigatonnes (Gt) of CO2-equivalent (CO2e) emissions. By 2010, this had dropped to 16-17Gt, primarily due to their release into the atmosphere. The Protocol also has other significant blind spots, which we laid out in the briefing we presented to delegates here. On the plus side, we know that the Montreal Protocol’s actions have set the ozone layer on the path to recovery by phasing out 98 per cent of global consumption of ozone-depleting substances. However, just last year we witnessed the first ozone hole in the Arctic, and we know that climate change will alter and possibly delay recovery of the ozone layer, which is not expected for more than 50 years. The negotiation process has not always run smoothly. There have been numerous occasions over the years when countries have failed to see eye-to-eye. Generally speaking, though, differences have been overcome. A notable recent example was the decision to accelerate the phase-out of HCFCs in 2007, which will reap huge benefits, not just for the ozone layer but also the climate. Now the Montreal Protocol’s relatively unblemished record of forging consensus looks as though it could be severely compromised by the actions of just a few countries – in particular India, China and Brazil – to block agreement on a proposal to globally phase down HFCs. HFCs are man-made chemicals which were introduced to replace HCFCs. They’re also the fastest growing source of GHG emissions worldwide, and are predicted to soar to 5-5-8.8 gigatonnes of CO2-equivalent by 2050, equivalent to 9-19 per cent of global CO2 emissions under a business-as-usual scenario. Eliminating them would represent a significant step forward by the international community at a time when the effects of climate change are becoming increasingly hard to ignore. At this week’s meeting, the same old tired arguments were trotted out by opponents to the proposals, despite the wishes of a majority of countries to start discussing substance. 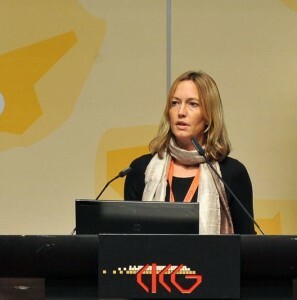 Some progress was made; for example, it was agreed that the Protocol’s technical and economic assessment panel would undertake a detailed assessment of alternatives to ozone-depleting substances, which should help move the proposals more quickly forward when we have overcome the current political barriers. My next trip will be to the international climate negotiations in Doha, Qatar, where HFCs are expected to feature prominently on the agenda of Parties negotiating an increase in pre-2020 mitigation ambition. We’ll be pushing for a strong signal from that forum that the only rational way to deal with HFCs is to entrust them to the established and highly effective institutional structures of the Montreal Protocol. That would remove the current roadblock behind which the naysayers are hiding and would set in train serious and substantive discussions about an HFC phase-down at next year’s meetings. In that context, it’s worth remembering that The Montreal Protocol is not only the best global climate treaty we have, it is the only one we are likely to have for at least the next eight years. It’s a busy time in the world of fluorinated gases (‘F-gases’), those super greenhouse gases used in refrigeration and air conditioning. 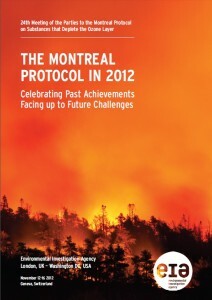 Last week, the European Commission released its much-anticipated proposal for a revised EU F-gas Regulation and this week we are celebrating the 25th Anniversary of the Montreal Protocol, the international environmental agreement that saved the ozone layer from certain destruction by CFCs and HCFCs. The EU proposal, which emerged after extensive internal wrangling within the European Commission and a ferocious counter-lobby by multinational chemical and equipment producers, has fallen well short of expectations. Compared to previous versions that were leaked a few weeks ago it is far less ambitious, foregoing the opportunity to ban the use of HFCs in a number of sectors and proposing a weak economy-wide cap and phase-down. Needless to say, we at EIA will be looking to the European Parliament and EU Member States to rectify this during the coming months – the battle’s far from over and we’re confident that the facts are on our side. Two proposals for a global phase-down of HFCs have been on the table at the Montreal Protocol for several years now. However, formal discussions have been repeatedly blocked by India and China, both of which have sizeable domestic fluorochemical industries. At today’s opening session of the 24th Meeting of the Parties (MOP 24) in Geneva, that same obstructive spirit was on full view as China and India called for discussion of HFCs to be entirely deleted from the agenda. HFCs are the fastest-growing source of greenhouse gas emissions worldwide; their elimination would represent a significant step forward by the international community at a time when the effects of climate change are becoming increasingly hard to ignore. It’s time for the countries of the world to step up to the plate again. If we don’t move fast now, we’ll only end up berating ourselves for our lack of resolve in the long run.